Everything maintenance teams need to know about OSHA, its regulations, compliance standards and how to avoid OSHA violations. Here’s a scary stat: 85 health and safety violations were committed every day across the US in 2018. In total, there were more than 31,000 fines doled out for breaking the Occupational Safety and Health Administration’s (OSHA) top 10 health and safety violations alone. Besides the potential for accidents, injury, and death, these fines inflicted a heavy toll on the bottom line, costing businesses over $400 million last year. 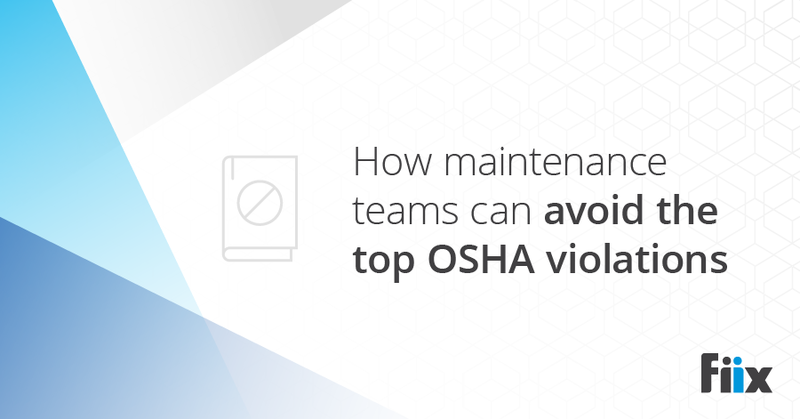 Many of the top OSHA violations have a connection to everyday maintenance tasks, especially for those working in manufacturing. Another thing they had in common? They were all preventable. With solid planning and some helpful technology, it’s easy for maintenance teams to avoid health and safety violations while creating a better health and safety program. OSHA is the government-run organization in charge of assuring safe and healthy working conditions for millions of public and private sector employers and workers across the US. They do this by setting and enforcing standards and by providing training, outreach, education and assistance. OSHA is responsible for the hefty price tags attached to noncompliance and is the organization that maintenance teams have to impress most often when it comes to health and safety audits. The following is a brief rundown of the rules and responsibilities mandated by OSHA and the impact of breaking these regulations. Under OSHA law, employers are responsible for providing a safe and healthy workplace for their workers. Employers must provide workers with a hazard-free workplace and must follow all OSHA standards. Employers must find and correct all safety and health problems, first by changing working conditions, like switching to safer chemicals, and then by providing protective equipment. Besides the potential for accidents, injury, and death, OSHA violations inflicted a heavy toll on the bottom line, costing businesses over $400 million last year. Prominently displaying official OSHA requirements, OSHA citations, and injury and illness data. Informing workers about hazards in a language they can understand through training, labels, alarms, and other methods. Keeping accurate records of work-related injuries and illnesses. Performing tests in the workplace, such as air sampling. Providing the required personal protective equipment at no cost to workers. Not retaliating against workers for using their rights under the law. These are some examples of the broad policies employers at production facilities need to follow. However, there are many OSHA regulations that apply to specific industries or in certain regions. Some examples of these standards include providing fall protection, ensuring safety in confined spaces, putting guards on dangerous machines, and providing respirators to employees. What rights and responsibilities do workers have? The right to file a confidential complaint to have their workplace inspected. The right to receive copies of the results from health and safety tests and monitoring. The right to participate in an OSHA inspection and speak in private with the inspector. The right to file a complaint with OSHA if they have been retaliated against by their employer. The right to file a complaint if punished or retaliated against for acting as a whistleblower. How are OSHA standards created? OSHA standards-setting process is a multi-step activity that relies heavily on public engagement. New standards can be recommended either by OSHA itself or through third-party petitions from organizations like the National Institute for Occupational Safety and Health, state and local governments, and labour representatives. After deciding to move forward with a new standard, OSHA often asks the public for their feedback and insight. After considering all information and testimonies, OSHA develops and issues a final standard that becomes enforceable. The compliance officer presents their credentials. They explain why the workplace was selected for inspection and describe the inspection process, including walkaround procedures, employee representation, and employee interviews. The compliance officer and facility representatives walk through the workplace, inspecting for hazards. The compliance officer talks with the employer and employee representatives about their findings. If no hazards or OSHA violations are found, the inspection is over. If an inspector finds violations or serious hazards, they may issue a citation and/or fine. A citation outlines methods that can be used to fix a problem and a deadline for correcting the issue, as well as the date by which the corrective actions must be completed. What are the fines for OSHA violations? Fines for non-compliance of OSHA regulations can vary based on the seriousness of the violation and the organization’s record and the industry. However, OSHA has outlined maximum fines, which for 2018 include $13,260 for minor and serious violations and $132,598 for willful or repeat violations. Here are a few tools and techniques maintenance teams can use to steer clear of violating some OSHA regulations. Each of these tips can be implemented through maintenance management software, such as a CMMS. It’s never easy to tear yourself away from a job when your to-do list is a mile long. Then again, when you don’t make time for health and safety tasks, it can result in a huge fine. Over 4,500 companies faced this exact situation in 2018 after they violating the OSHA’s hazard communication standard by failing to provide proper hazard training and maintain the necessary data sheets. OSHA is also responsible for the hefty price tags attached to noncompliance, and is the organization maintenance teams have to impress most often when it comes to health and safety audits. Maintaining records and providing health and safety training is often a hassle, even if it’s extremely important. Having an efficient method for storing employee information can go a long way in saving you time and helping you stay compliant. Create employee profiles for everyone on the maintenance team. On each profile, list the training that person has, the dates they completed training, and the training they still need. Make sure to note deadlines for certification renewals on each profile. Create a notification system so both you and the employee are alerted about any training that is about to expire. Lastly, use these profiles to communicate any hazardous situations or changes in policy to all staff. Lockout/tagout violations ranked as the fifth-most-common breach of OSHA regulations during 2018, even with it being standard procedure across the maintenance and manufacturing world. Facilities were cited for failing to implement an energy control program and to provide training. Energy control programs help maintenance staff avoid being injured by the massive amounts of hazardous energy that is often stored by equipment. Although many facilities have an energy control program, they are often not implemented properly. One of the biggest obstacles to policy implementation is a lack of accessibility. Technicians are extremely busy and are often overwhelmed on a daily basis. If they are working on an asset, need to conduct a lockout/tagout and don’t know the proper procedure, it’s not likely that they will spend valuable time looking for the information. Making an energy control program document available digitally and accessible through a mobile device eliminates this problem, is a factor in the successful implementation and helps facilities avoid a costly OSHA violation. Companies were handed over 9,000 fines for inadequate fall protection in 2018, with these violations scoring top spot and eighth place on the OSHA’s list. The most common rules that were broken were failing to provide sufficient training and proper protective equipment. Training your whole workforce might be the end goal of your fall protection plan, but it might not be realistic in the short term. However, there are a few ways employers can better manage their existing pool of trained maintenance staff to avoid violating OSHA regulations. You must be able to cross-reference work orders with staff who are certified (and who have proof of certification). The best way to do this is through a digital maintenance work order system. This system can tell you who is available and the best person to do the job, so no one is working at heights without the proper training. Equipment for fall protection often includes harnesses, guardrails, anchors, and other, larger pieces. These items need to be maintained and stored properly. That is why a well-built inventory management system is a must for safety and to avoid OSHA violations. The ability to track where parts are stored, their history of use, and how often they’ve been maintained is crucial. It ensures that workers know where to find the proper protective equipment when they need it and that they know it will be in optimal working condition. Having a digital inventory system makes this information more accessible and creates a more efficient process. Machine guarding was another common OSHA violation in 2018, averaging 5.5 infractions per day. Inspectors cited companies for point of operation and for guards that were not attached to machines. It’s easy to assume this violation can be avoided by simply walking around your facility, installing guards where needed and training staff to always use them when necessary. However, this isn’t a set-it-and-forget-it issue. It requires an ongoing effort to ensure guards are installed and maintained properly. A guard may rust over time, diminishing its effectiveness. An employee may remove a guard for a project and not replace it properly or at all. That is why you and your maintenance team must be diligent about machine guarding. One way to ensure consistency with machine guarding at your facility is through automated work orders and maintenance triggers. Determining a maintenance trigger for each guard will help you plan an inspection, repair, or replacement well ahead of time. For example, a certain guard may be slated for replacement every three months. These maintenance triggers can then be scheduled using an automated work order system to ensure you’ll be alerted of upcoming maintenance or inspection for machine guards so tasks don’t fall through the cracks and leave you vulnerable to citations or fines. The last entry on the OSHA’s list of top violations is one that can apply to many maintenance activities and can have a huge impact on safety. There were over 1,500 instances of facilities failing to provide personal protection equipment (PPE) and lifesaving equipment or failing to ensure employees used them in the right situation. PPE can vary from job to job in a facility. One maintenance task may require an individual to wear hearing protection while another may call for a dust-blocking face mask. It can be difficult for staff to remember what PPE is associated with which job, which means tasks are not always completed in the safest way (or in accordance with OSHA regulations). Solving this problem can be as easy as attaching a checklist to each maintenance task or asset that outlines the required PPE. Not only will this standardize PPE practices at your facility, but it also reminds staff what they should be doing. If the checklist is available in a digital format, it is even more accessible to staff, which means that the protocols are more likely to be followed.